Woodburn residents favor keeping mature trees over preserving parking spaces, but an ideal scenario would see both accommodated. That was one point that emerged during the Sept. 24 Woodburn City Council meeting as city staff members presented an update on its First Street Improvement plan. The city sought council input as planners worked toward its "70-percent benchmark," a target designating that 70 percent of the design is completed, which would enable the city to proceed on the estimated $4.47 million project within its prescribed timeline. "The 70 percent benchmark will use the survey results going forward, unless the city council wants to do something different or provide more feedback," Woodburn City Administrator Scott Derickson said. "We're using the survey results as kind of a guideline and criteria moving forward to the city council with what we think the proposed design will be." Woodburn Economic Development Director Jamie Johnk and city engineer Dago Garcia addressed the council and shared city survey results taken over the weeks leading up to the meeting. Several questions posed in the survey were directed at trees and reactions to the proposed improvements to the intersection at First and Garfield streets. Johnk said 76.53 percent of the respondents expressed approval with the intersection design. Additionally, a question regarding mature sycamore maple trees adjacent to the library saw 60.2 percent favoring forfeiting parking and keeping trees; 39.8 percent preferred giving up the trees in favor of parking. Johnk said the comments ranged across the spectrum regarding trees versus parking, while Garcia indicated that engineers may be able to work out a solution that allows both, or at least saves some parking spaces. The survey, which gathered feedback from 98 participating residents, also elicited three preferred tree varieties that are agreeable to downtown streets as part of the project: apollo maple, sentry ginko and skinny genes oak, respectively, were the favorites. "The overwhelming favorite was the apollo maple," Johnk said. "It's a beautiful tree; very columnar, beautiful colors in the fall. And then the second winner was the ginko tree, again a very nice tree (with) nice leaves that get very colorful in the fall as well." Johnk worked with an arborist to put together a list of columnar, or verticle-growing, tree varieties that can adorn downtown blocks without complications, such as wide-growing roots affecting sidewalks, dropping fruit and falling branches. The arborist also examined the mature library trees in question and determined they were in good health. Johnk and Garcia originally presented First Street improvement project plans to the council on Aug. 28. During the session the proposed sidewalk bulbouts of the intersection design reportedly drew opposition from the public, primarily regarding reduced parking and narrowed streets at intersections. The bulbouts are intended to facilitate pedestrian safety by shortening street-crossing distances and enhancing driver visibilty. The bulbout designs also bring intersections into ADA compliance. But they narrow intersection widths by eight feet on each side, a total width of 30 feet, and reduce parking by four and six spaces. Planners indicated that they are working on a compromise or balance that could reduce the size of the bulbouts, smaller than what is on Front Street, and also encourage trucks toward a favorable route that would alleviate effects they can have on vehicular traffic. The council requested examining the effects of squaring off the corners and to determine if that affects the ADA requirements. Additional attention on the bulbouts and traffic appeared to be, in part, prompted by issues that surfaced on Front Street when they were initially installed there. 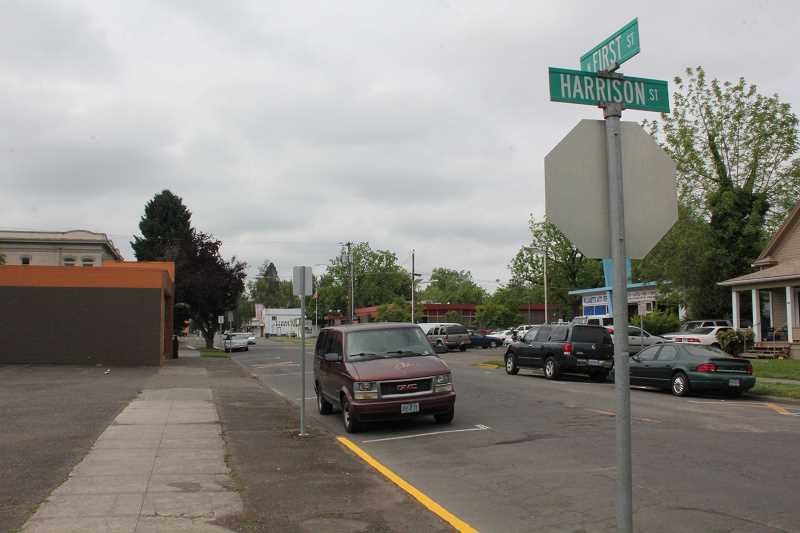 "The city administrator will have staff discuss intersection design options with the engineers and report back to him on costs and timeline associated with redesign," Woodburn spokesman Tommy Moore said. "After which, he will follow up with councilors." Other elements of the project include: Second Street parking lot improvements between Grant and Lincoln streets, providing 45 parking spaces; permanent striping; renewed asphalt surfaces; upgraded approaches; upgraded storm sewer; upgraded lighting; added security camera and public parking signage; upgraded alley sections between Cleveland and Garfield streets; concrete pads for Dumpsters and asphalt. A breakdown of the project costs sees improvements to First Street estimated at $3,964,000; alley improvements between Cleveland and Garfield streets $356,000; Second Street parking lot $150,000. Current timeline estimates envision the project's design and engineering to be completed in November and construction bids due by January 2019, with a contract awarded by February 2019. Ensuing timeline items include pre-construction public outreach in March 2019, with construction underway by April 2019.The anticipated completion date is February 2020.